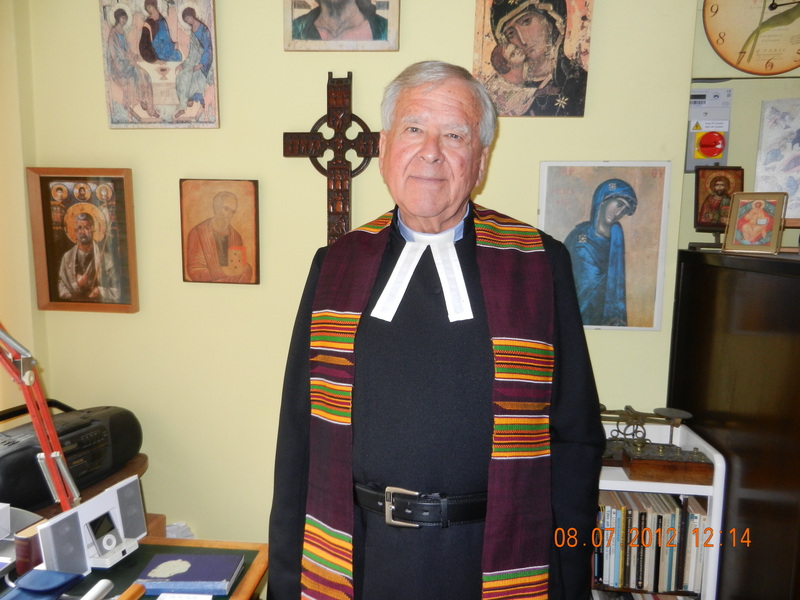 The following descriptive account was written by Reverend Peter Perowne, the first minister assigned to the Rio Abajo Methodist Church, who has graciously given us permission to publish here this account. We are delighted that we are able to provide for our readers this historical, as well as cultural and spiritual view of the Silver People of Panama and for their descendants and our friends all over the world. As Reverend Perowne informed, the original of this narrative was published in the publication The Methodist Recorder last week’s issue, for those of you who are subscribers to that publication. Ministers often receive invitations from former churches to return for a Church Anniversary and are usually glad of the opportunity to renew friendships from the past. This one came from Panama to return for a 50th Anniversary. Rio Abajo Methodist Church had remembered that I was the first minister to be appointed to their church. So on 2nd September, 2012 I was again their appointed preacher; my first return after nearly fifty years. The service was led by their present minister, Rev. Danoval Johnson, preceded by a band-led procession through the streets. Many wore shirts and dresses of gold as they followed the band singing “The Church’s One Foundation…” I had been asked to send my sermon two weeks in advance so that it could be translated into good Spanish and the service was fully bilingual. Fifty years ago we had begun to use some Spanish in a mainly English service and I would preach in hesitant Spanish once a month. Spanish was not very welcome to most of the congregation then and it all seemed rather artificial. Now they are confident in Spanish and their efforts have been rewarded in the presence of several Spanish speakers, including Local Preachers, in the former English speaking, mostly Caribbean membership. I was sent to Panama as a Methodist Missionary in 1960 and whilst there we had adopted three Panamanian children and this was their first opportunity to return to see the land of their birth. We were all welcomed with open arms. No effort had been spared in preparing for our return. The new air of prosperity for many had not spoilt their kind and generous spirit. The church was full to bursting. They came with photographs and stories from the past to help me remember them from fifty years earlier. One lady apologised for having scratched my face when, at a youth camp, I had plucked her from a river where we had been swimming, at the approach of a snake. We were sent home laden with gifts for my wife, Pat, whose health had sadly prevented her from joining us. Many improvements had taken place over the years to the church, the hall and the manse. One of the highlights of the visit was the return to Bocas del Toro, my first circuit, and the area from which two of our children come. Our younger son, Paul, was welcomed back to the island of Bastimentos by his birth brothers, sisters, aunts, uncles, cousins, nieces and nephews like the prodigal returned. Later, on the mainland he met his mother and more of his seven brothers and seven sisters and their families. It was wonderful to share in the joy of their discovery of one another and to see how so many of Paul’s characteristics were repeated in his brothers. In the Bocas circuit all the churches have been completely rebuilt. In Bocas church a splendid youth choir sang for us, the words appearing on a screen built into the wall. Almirante church on the mainland now runs a day school in a fine set of premises. All was so much better than the old wooden churches of my day. I learnt that most of the good things that I saw dated from a few years after the earthquake that had devastated the region in 1991, reducing many buildings to rubble and inflicting both injury and loss of life. Outside help arrived and the helpers discovered what a paradise had been hidden from the world! Fifty years ago a walk down the main street of Bocas town required a torch to avoid stepping on all the land crabs. After dark people would go to bed because mostly the only light was from a candle or hurricane lamp and most floors had dangerous weak spots where the termites had eaten. Today Bocas town is brightly lit and tourists occupy a multitude of hotel rooms and visit the shops and bars that have suddenly mushroomed into being. They sign up for boats to take them to islands teeming with wild life, to explore the coral reefs, to the lagoon for fish and porpoise watching and for every kind of water sport. Fifty years ago I discovered what it was to be close to the sea in all its moods and to the abundant and sometimes terrifying wild life when I pointed my canoe in the direction of Coco Cay and negotiated a swampy jungle trail to take the Gospel to a scattered group of Guaymi Indians. Some of them had found their way to the Bocas manse and pleaded for me to visit them. I led a service in Spanish for them while an Indian translated into their dialect. Afterwards I found myself spending even more time in caring for their health needs. I learnt to diagnose, give injections, and inoculate the children. A school was developed to teach them to read and write. I returned to discover a secret. That day when the little group came to Bocas manse they had set out to ask the Roman Catholic priest to visit them. He was out and they dared not return empty! How history is made! Now after fifty years, and still ignorant of their secret, my heart rejoiced to find them already at worship in a new purpose-built church on a hill approached by a concrete path with built in steps. A whole community was now living within sight of the church. Their own worship leaders have developed a style of their own following the same order of service that they had received. We were thrilled to meet again after so long. Youngsters I had baptised had become leaders and Local Preachers and their sons were following them. As the service continued they came forward to give thanks, as did one of the women that I married. She presented me with a small woven sisal net bag like the large ones they used to carry their babies in. She was most grateful for the care I had given her in times of sickness. A man came forward to explain that when he was 13 he was bitten by a snake and taken to Bocas hospital and left to die. Then he heard that I had gone to visit and had given blood so that he could have a transfusion. He believed that was why he was alive today and he sang a solo to give thanks. They had prepared a meal in my honour and it was so good to share their hospitality in an Indian home so different from those of years ago. I was greatly heartened by what I found on my visit to Panama. Their manner of valuing people above all else is just as important to them in the new-found prosperity as it always had been and is still both refreshing and challenging to those coming in from outside. I was glad to see that members of the Guaymi Indian tribe have been trained and equipped to minister to communities beyond their own. I met Rev Antonio Trottman from Cusapin, part of the Valiente Indian Mission founded by Rev Ephraim Alphonse nearly a hundred years ago. He is the newly appointed minister to the Bocas circuit, having served his first years in Honduras. Many wonderful people contributed to make our visit such a happy success but I do want to mention in particular the Rev Mario Nicolas who did so much to prepare the ground in Bocas and thoughtfully accompanied us the whole time. Mario was a very young man fresh from school in our early years in Bocas. He felt called to preach and trained as a Local Preacher and offered as a candidate for the ministry. He has become a caring pastor and is honoured as a leader of his people. Having served his Church with distinction, he is now, like me, a supernumerary minister and still serving. I feel very proud to have had a share in his formation and have been amply repaid. This entry was posted in Bocas del Toro, Church in Panama, Methodist Church, Silver People and tagged Bishop Ephraim S. Alphonse, Cusapin, Guaymi people of Panama, Methodist Church of Rio Abajo Panama, Rev. Peter Perowne, Rio Abajo. Bookmark the permalink. What a lovely relate, and very touching as I learned of my relative, the Rev. Antonio Trottman whom I pledge to meet on my God’s will return in 2013. My roots flourished from the Cusapin area and just last year I finally found the connection to relatives out there. Thank you Rev. for such a vivid visual of your tour. Many Blessings. I couldn’t agree with you more! We are very blessed to have received from Rev. Perowne these precious and beautiful memories of an important historical time for our people. Thank you for stopping by.